This week, a compound that defies naming conventions and helps us push back the darkness. Here’s Brian Clegg. It’s easy to fall into the trap of considering the chemical elements in compounds as two distinct types, with metals taking the lead and the rest as a supporting cast. When a metal is present in an inorganic compound, we put it in pole position – in, for example strontium chloride or aluminium oxide. It would just feel wrong to make that oxygen aluminide. Which is why strontium aluminate feels a little odd. We have strontium firmly in the lead, but at the back end there is a pair of aluminium atoms and four of oxygen to make SrAl2O4. (There are other structures with different combinations of the elements, but we’ll stick with the base model for now.) If you feel that aluminium is hard done-by, the alternative systematic IUPAC name for the compound is the unwieldy dialuminium strontium oxygen(2-). Before exploring strontium aluminate’s main function, it’s worth mentioning that it can be used to make a specialist cement which can withstand temperatures as high as 2,000 degrees Celsius. Because of this, strontium aluminate cement has been considered for long term storage of radioactive waste. Although radioactive waste itself isn’t luminous, we associate an eerie blue glow with water-cooled nuclear reactors because of the way that they emit Cherenkov radiation. This occurs when the beta particles given off during nuclear decay shoot through the water faster than the speed of light in that medium, leaving behind the visual equivalent of a sonic boom in the form of intense blue light. 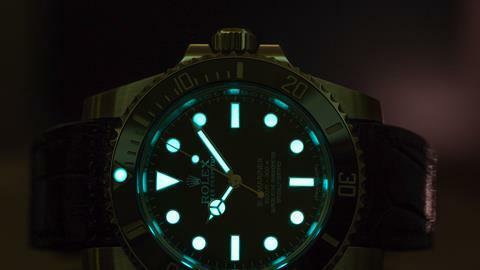 In a far less dramatic way, the ability to provide an eerie glow is the special trick up the sleeve of strontium aluminate – with a little tweaking, this odourless, yellow-white powder becomes a widely used photoluminescent phosphorescent material. Let’s unpick that name. 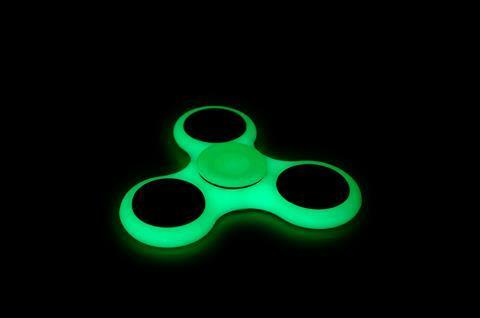 A phosphorescent material gives off light as a result of the energy stored in its atoms. As electrons drop down from higher to lower energy orbitals, they give off photons of light, each corresponding in energy to the difference between the two levels. The ‘photoluminescent’ part indicates that the energy originally used to bump the electron up to a higher level came from light – in this case, typically in the ultraviolet range. So, what the strontium aluminate can do is to absorb photons when exposed to light, then, later, it will slowly give off photons. Some substances, known as fluorescent materials, re-emit such energy straight away, but the particular configuration in the strontium aluminate requires a so-called forbidden transition, which has a very low probability of occurring, meaning that it can take several hours for the photons to be emitted and produces a low-level glow. The strontium aluminate needs to be doped with another material – often europium or dysprosium – for this effect to occur. The presence of this impurity in the crystal lattice sets up the capability of making the forbidden transition, enabling the strontium aluminate to hang on to the energy from the incoming photon. The combination of strontium aluminate and europium results in the longest lasting commonly used photoluminescent phosphorescent material. 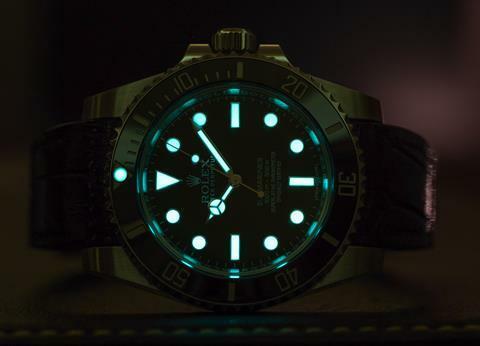 It is one of the more expensive glow-in-the-dark substances, but worth it for this length of delay – the glow can last over 14 hours, though for most of this time it will be relatively weak. The aluminate powder is usually either suspended in a liquid medium to make paint – Nissan have made a glow-in-the-dark version of their Leaf electric car this way – or embedded in plastics or vinyl to produce glow-in-the-dark objects. Basic strontium aluminate doped with europium produces a green glow, while the heavier aluminates such as SrAl12O19 produce dramatic blue colours. Although the main function of strontium aluminate’s glow is entertainment, it is being used experimentally in diagnostic tests for pathogens. A process used for detecting compounds using low cost equipment known as immunochromatographic lateral flow assay (used in home pregnancy tests) has been enhanced using nanoparticles of doped strontium aluminate, where the inbuilt lighting ability of the particles eliminates the need for the expensive optical hardware required for some kinds of analysis, making the technology more widely available. This process is still under development but holds out a lot of promise for the future. There is something special about materials that glow in the dark with a cold light requiring no apparent power. Whether it’s the delicate illumination of a glowworm, or the greenish glow of strontium aluminate embedded in plastic stars on a child’s bedroom ceiling, it’s a magical effect. Strontium aluminate may not be a compound that changes the world, but it brings a little light into our lives. That was Brian Clegg with strontium aluminate.If you’ve been listening to the Chemistry in its element podcast from the very start, you’ll know that we started our chemical journey by exploring the periodic table, making our way through the elements. That table has changed a bit in they years since we moved on to compounds, so we thought it was time for an update. And as it’s Dimitri Mendeleev’s birthday on the 8th of February, now seems like a good time to start. So next week, Kit Chapman brings us the story of Nihonium, element 113, and the century long wait to name an element after the Japanese homeland. Join Kit next week, and let us know if there are compounds you would like us to cover – tweet @chemistryworld or email chemistryworld@rsc.org. I’m Ben Valsler, thanks for joining me.